Ocular surface diseases are important public health issues that have negative impacts on the quality of life and productivity of patients. Because they are more common in older females and perceived as female diseases, patients from different demographics are frequently underdiagnosed. Furthermore, statistics conclude that eye care professionals underappreciate the impact of ocular surface diseases on patients’ quality of life and productivity and do not appear to fully recognize the importance of early detection, underlying pathologies, and appropriate management strategies for these diseases. This activity is designed to help eye care professionals recognize these important issues in order to make the best informed clinical decisions based on an in-depth understanding of the mechanisms associated with these disorders. 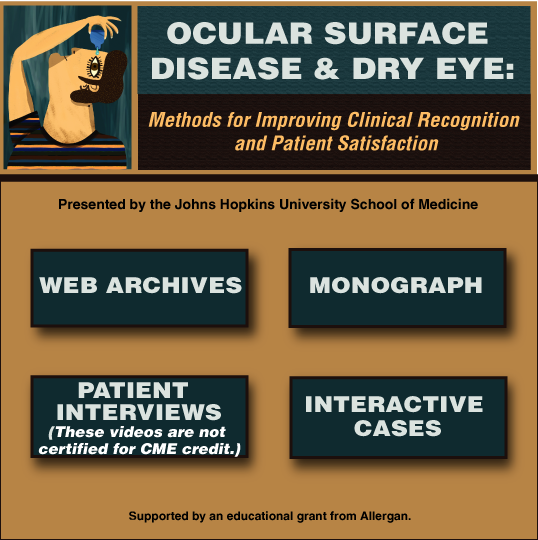 The goal of this multipart activity is to provide eye care professionals with the understanding of ocular surface disease pathology, the impact on quality of life, and cost-effective management strategies to improve outcomes. This activity is designed for eye care professionals, including ophthalmologists, comprehensive ophthalmologists, cornea specialists, cataract surgeons, glaucoma specialists, retina specialists, and optometrists. No prerequisites required.